The culinary use of chili peppers can never be underrated, as the peppers are used commonly in every other cuisine. People in the 16th century actually went on long expeditions just to find some fine quality peppers. Spice trade used to be a lucrative one back in those days and nations strived to get their hands on them first. That is how surprisingly important peppers were and still today, no recipe is complete without some use of pepper, in any form or variety. The immense variety of peppers has put many people into confusion, as they all range in appearance, colors, and hotness of the spice. It is important to understand peppers before you choose the right one for a meal. Fresh peppers taste entire differently from their dried and crushed forms, so does their intensities. So, this article is here to enlighten you on pepperoncini, and account the differences and importance of a variety of chili peppers. And before actually discussing the types of peppers, we will have a quick review of simple storing methods. So that you could enjoy them all every season. The word Pepperoncini is English name for Italian Pepperoncino, which is a hot chili pepper. The hot chili pepper is different from the sweet one, and it is called pepperoni or pepperoni. It was during the late 1400s that pepperoncini peppers were first discovered and later become central to Italian cuisine. Before that, it was considered a poisonous plant. The major reason for its popularity was it was cheap and convenient for all the classes. Where other spices were expensive, pepperoncini peppers were easily available to all. Another great reason for pepperoncini popularity was its hotness. Unlike Chinese peppers, it is way more intense; and hotter than all other peppers from Asia. It was in 1964 that the pepperoncini spice was first ever used in the cookbook recipe. And ever since then it became the part of every other cookbook. Pepperoncini is most popularly sold in its crushed form at the markets in Sicily. It is used in moderation in the Italian cuisine in both the crushed and powdered form. Its flavor is intense, and it is added in small amounts. I personally use it for tangy recipes. Calabrian cuisine also makes good use of the pepperoncini pepper. It has cultural significance. Peppers are hung from a building and dried under the sunlight. They are available in fresh whole, pickled, crushed, fried, paste and powdered variety. Scoville scale identifies the hotness of pepper, and it is rated about 15000 to 30,000 on the scale. Pepperoncini peppers are found in two main varieties; one is Greek and Italian. Both the varieties differ in taste and shape. Italian pepper has long big fruits, and it is more bitter than the shorter and sweeter Greek pepperoncini pepper. Both of them have mild hotness and have their distinct bitter taste. they appear in yellowish to light green in color and when fully ripen these peppers turn red. They all have wrinkled skin, which makes them distinct from rest of the varieties of chili pepper. Pepperoncini are termed as middle ground food because they are moderately healthy. I identify them as a condiment like olives, pickles, and other tangy vegetables. Pepperoncini have no fats, and they have extremely low calories. This trait alone makes these peppers suitable for all sorts of diet plans. Since they are mildly tangy, they do not aggravate any health condition or stomach acidity. However, it has to be used in moderation in all the meals and can be best served as a garnish. Finely slice the peppers before adding to the food, to incorporate better taste. According to the statistics, by eating four pepperoncini in a single serving, a person can get as many as 10 calories. Out of which there are about two grams of carbohydrates and one gram of fat. The other major ingredient found in pepperoncini is sodium, about 360 milligrams per serving. American Heart Association itself recommends about 1500 mg of sodium per day. So, keep the intake of the pepperoncini as per this limit by taking a limited amount of the pepper in a single serving. Pickle peppers contain more salt, so avoid pickling if you want to restrict the sodium intake. Several studies have confirmed that the entire capsaicin family can prolong life. Though there is no direct evidence except that people who add spice through pepperoncini show greater life expectancy on average. It can alleviate the levels of high blood pressure and reduce the formation of blood clots and cholesterol levels. It does not mean that we should go for spicy food all the time. 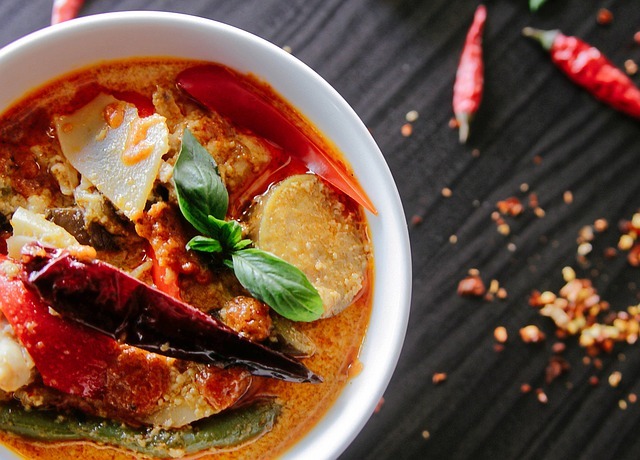 Even a little spice can give great benefits in terms of health. I came across with many people who are concerned about the carb content of these peppers, especially the ones who are on either low carb diet or cutting calories in some manner. Their concern is genuine if we consider the ongoing health problems. Pepperoncini contains quite a low amount of carbohydrates, so they are perfect to spice all the ketogenic meals. As I have discussed earlier, pepperoncini are not as hot as other chili peppers like chipotle or jalapenos. The measure up to 100 to 500 Scoville units at most. These scores are the second lowest in the pepper world. It is nothing when compared to jalapeno which measures to 2500 to 8000 Scoville units, and the habanero peppers score 100,000 to 350, 000 units. In that regard, pepperoncini peppers are perfect for people suffering from spice problems. Some of the Best Ways to Store Peppers! Pepper storage can instantly become a crisis when you are not aware of the methods. It was for me at least when I was not well familiar with the techniques. there are lots of myths and wrong advice which can distract you. so, I chose the following four methods to store the peppers, as they are most feasible, suitable and well preserves the peppers. It is the best way to store peppers for a long term. A single bottle of sauce can serve several servings. Preserving the pepper in the sauce also allows you to control the hotness as per your preference. It is up to us, to puree the peppers with a Liquid base or make a delicious sauce out of it by using other ingredients like onions, garlic, and tomatoes. To store the peppers in sauce, I start by sautéing 1 cup of chopped onion, 4 garlic cloves and 2 mildly hot peppers (Anaheim is a perfect match) and 2 small hot peppers. Cook for few minutes then add 1 lb. chopped tomatoes, 1 cup white vinegar, 3 teaspoons sugar and 2 teaspoons of salt. Cook this mixture until the tomatoes start to blend in. puree this sauce using a hand blender and allow it cool. 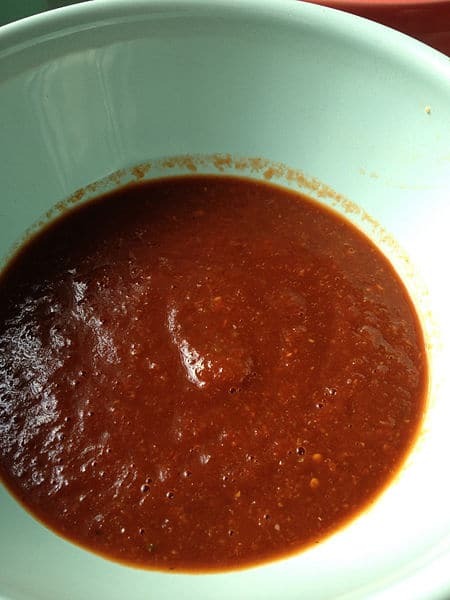 Preserve the sauce in an airtight container at a cool and dry place. This sauce can be stored for 1 month in the refrigerator and up to six months in the freezer. Pickling is the centuries-old tradition to preserve the peppers and several other vegetables. 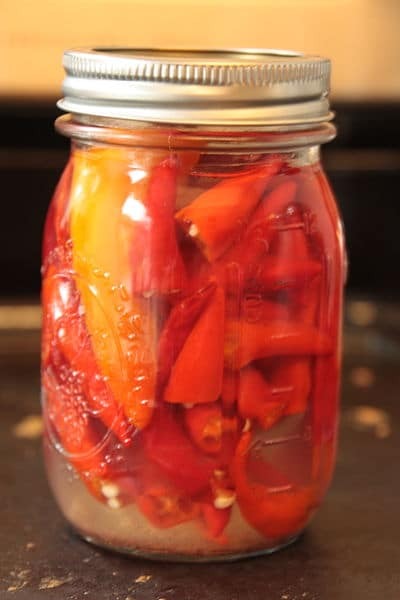 Pickled peppers can serve a number of culinary purposes, including garnishing of salads, stuffing of sandwiches and topping of tacos. I use jalapenos pepper to preserve as pickles, but you can use any other variety, depending on the flavors you desire. Jalapenos when pickled, their hotness is reduced to quite an extent. You can slice the peppers and remove the seeds to reduce the hotness. For a mild and sweet pickle, try the banana peppers or the pepperoncini. To pickle a pepper, you need to slice it and make sure to wear hand gloves. Add the peppers to a pot full of boiling water and let them stay for 2 minutes then instantly transfer them to an ice bath. After 2 minutes of the bath, transfer it to a mason jar. Boil vinegar and water in 1:1 ratio and season this solution with salt and sugar. After 2 minutes of cooking pour the solution over the peppers and seal the lid of the jar. Refrigerate for a month then use whenever needed. Pickles can be stored at room temperature, but it is advised to save it from high temperatures for longer preservation. If you are concerned about the use of salt in the process, either reduce the amount to a minimum or switch to Celtic salt. Dried crushed pepper flakes can be best preserved and used at home. for that, the peppers have to be dehydrated at 200 degrees F for 12 hours or more. This process can be carried out either in the oven, over a dehydrator plate or under direct sunlight, whichever method suits you the best. The air should be allowed to pass through the peppers while they dehydrate at low temperature. Peppers should be cut uniformly for even drying. Do not remove the seeds to keep up the hotness of the peppers. Spread all the sliced peppers in a baking sheet lined with waxed paper. Bake these peppers at the lowest temperature for 1 to 3 hours, keep the door of the oven opened a bit to avoid cooking of the peppers. Allow the dried peppers to cool then transfer them to a Ziplock bag. Seal this bag and crush the peppers by smashing them using a rolling pin. 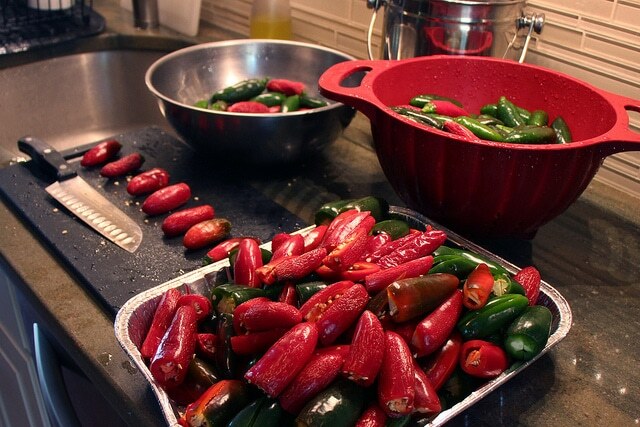 If you are not using the oven for dehydration, then prepare the peppers and spread them on a dehydrator plate. Let them dehydrate on the same low temperature for 3 hours or more until the peppers are completely dried. Be very careful while handling the dried peppers and especially while crushing them. That is why I use an extra pair of gloves and a crush them only in a sealed zip lock bag. You can even store the flakes in the same bag and use whenever needed. You can also use the traditional method of sunlight drying, but it takes more time and efforts. So, concentrate on the first two methods. Peppers can also be frozen for better preservation of their taste and hotness. By freezing they can keep their color and form. Peppers do not need to be blanched to freeze, but they have to be chared first. You can do that by grilling them on a gas grill or in the broiler. Charring is blackening of the skin and just when peppers are charred transfer them to bowl for cooling. Cover this bowl with a kitchen towel. When the skin of the peppers turns loose, peel it down and freeze the peppers. Charred and frozen peppers are good to use in soups, tacos and egg scramble. Each method of storage described here affects the taste of the peppers differently. Drying increases the hotness or rather concentrates it, rendering even a teaspoon of chili pepper spicy. Whereas pickling increases the sodium content of the peppers and reduces the hotness while increasing their sweetness. Such an impact of storage should be kept in mind, and the method should be selected as per the desired results. I generally don’t pickle the peppers, rather save them in the form of sauce and in the dried pepper flakes. Both of these forms can be stored for a long duration which is just perfect for me. Charring and freezing are good when you want to enjoy a strong and sharp Smokey flavor in the peppers. Pepper Town! 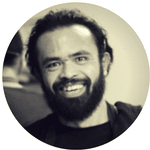 – Know Your Peppers! There are ceaseless varieties of chili peppers, only the edible ones are known to all. The green, red, yellow or orange, all belong to one single family, but they greatly range in their intensity, flavor, and texture. So, it is pretty important to realize which pepper is suitable for which cuisine and meal type. 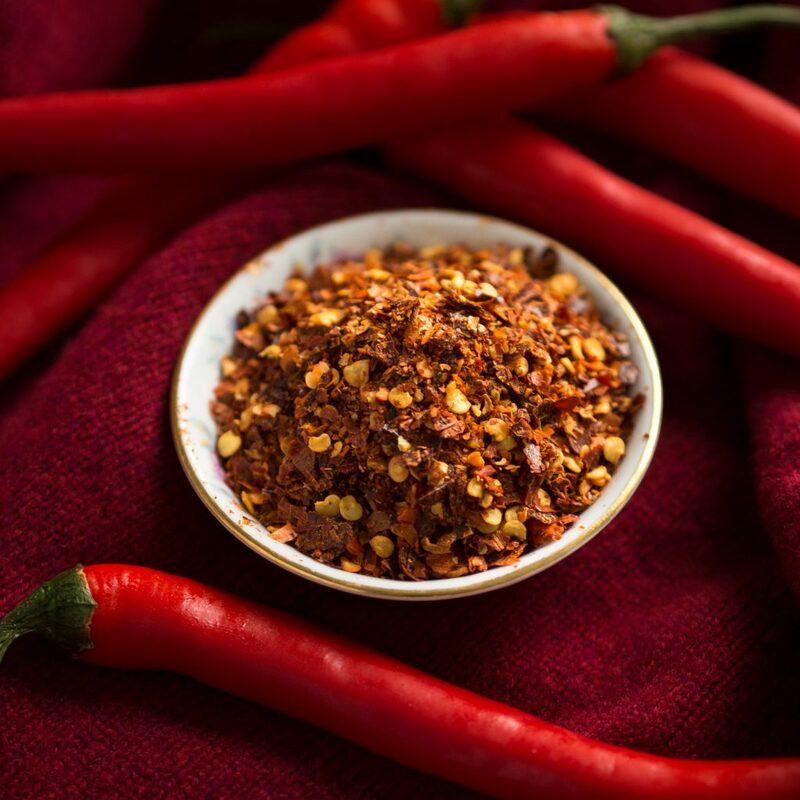 A Chinese pepper can be best used for Asian food, but chipotle is the one good for Mexican cuisine. Anaheim and banana peppers are good for stuffing and pickling whereas cayenne pepper is great to flavor curries, stews, and soups. 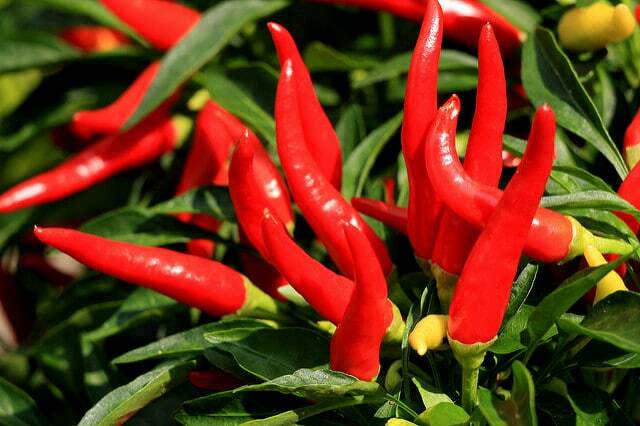 Cayenne pepper belongs to the family of Capsicum annuum. Yet it is not that hot and termed as a moderately hot chili pepper. Cayenne pepper powder is most often used to flavor several dishes. these peppers are 10 to 25 cm long in form and look skinny in appearance and have a bright red color with a curved tip. The skin of these peppers is rippled and grows on bushes. The hotness of these peppers is calculated to be 30, 00 to 50, 000 Scoville units. For culinary use, cayenne peppers are usually dried up and then ground to powder. They are either blended with seeds to make the powder hotter and grind without the seeds. Cayenne pepper can be used in egg dishes, meat curries, stews, hot sauce, cheese dishes, and casseroles. Cayenne pepper is not only known for its good flavor, but it has some of the most impressive health benefits. The most amazing is the boosting of the metabolism. 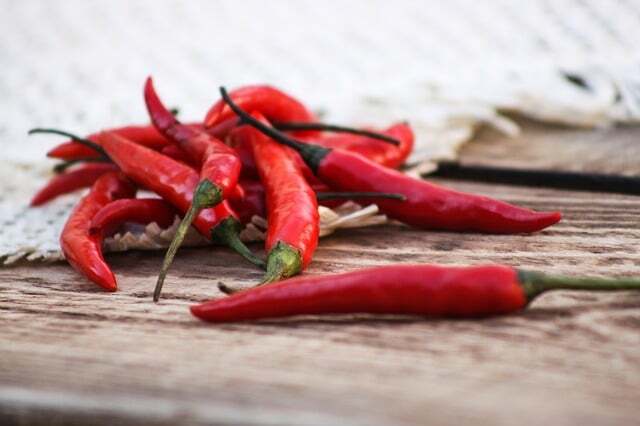 You might not have heard about diet-induced thermogenesis, but it turns real when you eat cayenne peppers. These peppers can burn deposited fats and activates the metabolic rate of the body. People with obesity find these peppers most effective, as they can reduce the feeling of hunger. It also lowers the blood pressure while aiding the digestive process. Cayenne pepper is also effective in treating cancers. Chipotle is derived from the word Chipotle meaning smoked chili. It is most commonly used in the Mexican cuisine as its taste rightly complements all the recipes from that region. For stews, chipotle is used in the chipotle adobo sauce. Its heat is close to the Anaheim pepper or the jalapeno pepper. It is obtained by smoking the jalapeno peppers. That is why besides spiciness, chipotle has a sharp smoky taste. It has thick flesh, and the peppers take a longer time to cook. They are used in stews and soup or along with lentils and beans. The chipotle pepper is popularly used in making Mexican chili, or varieties of salsas. Ground chipotle is used in combination with other spices to make marinades for meat. Moreover, it is also added to the hot sauce or barbecue sauce to add a Smokey taste. due to this distinct taste, it is best to season all the BBQ dishes. 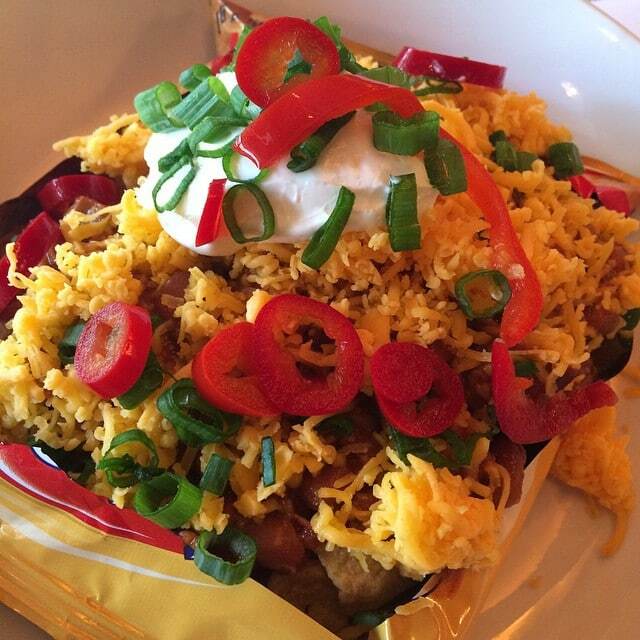 The name indicates that the peppers were discovered from the land of Anaheim California. It was in early 20th century when Emilio Ortega first brought the peppers to California, and from there it got so popular that it came to common use in the United States. It is used in salsas, tacos, and beans. It is grown originally in New Mexico and suit best to the regional taste and traditions. They are therefore also going by the name of New Mexico peppers. When dried, these peppers are sold as chile Seco del Norte. A fully ripen Anaheim pepper appears red in color. 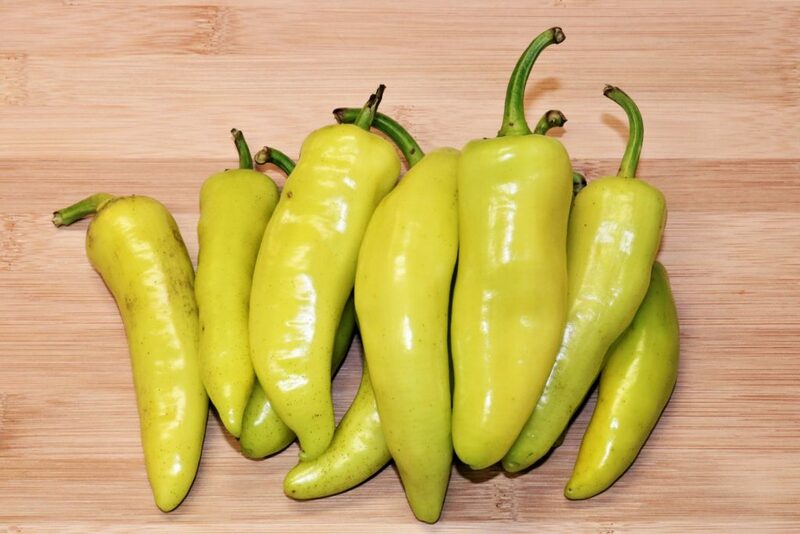 The banana pepper is also known by the name of banana chili or yellow wax pepper, that is because of the color and appearance of this pepper. It is bright yellow in color and has a mildly hot taste. it changes its colors as it ripens up, from green to red to orange. It is best for pickling and stuffing pepper recipes. It can be classified least hot among all the peppers shared here as it has the value of 0-500 Scoville units. The hotness and spice depend upon the age of the peppers. The riper the pepper, the sweeter it gets. Banana peppers are known for their good nutritional value. A single pepper contains 92 percent of the water and 5 percent of the carbohydrates and contains almost a negligible amount of fat and protein. It is a rich source of fibers, Vitamin C and B6. 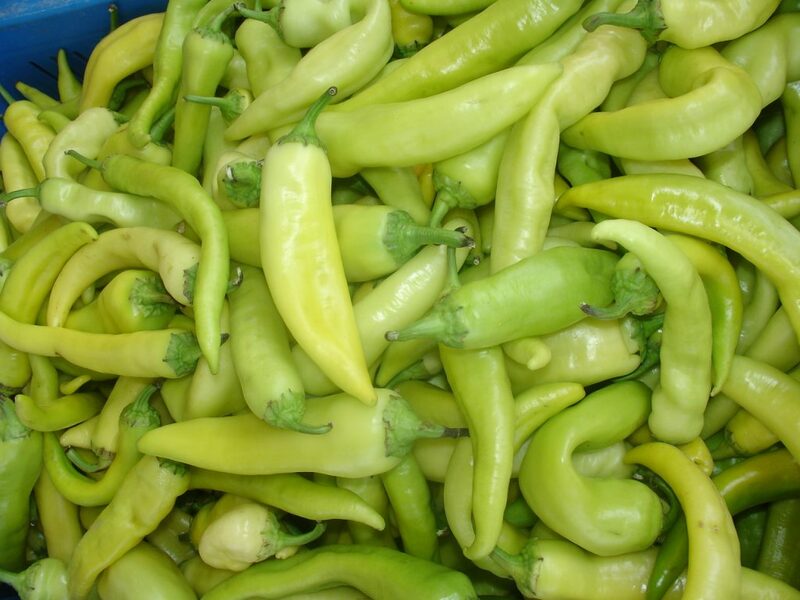 Banana pepper is often confused with the pepperoncini due to their similar appearance. At the grocery store, they almost look the same if you do not read the labels. Where pepperoncini are slightly tangier than the banana pepper. It’s rating on Scoville heat is higher than banana pepper. They both are yellowish in color. 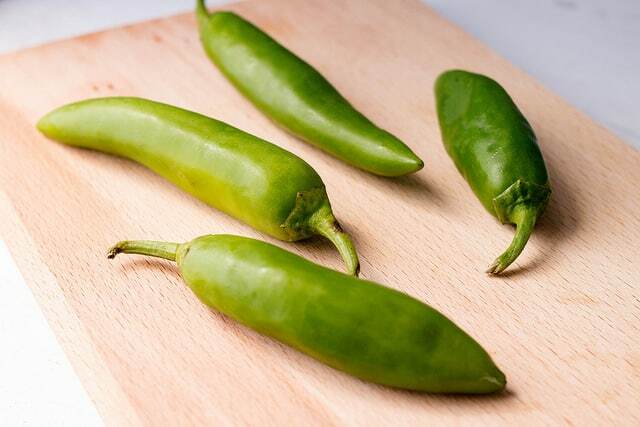 Banana peppers are the only hot pepper which has low or zero heat. You can identify the difference between them by looking at the texture of the skin. Pepperoncini’s skin is more wrinkle than banana pepper. Smooth yellow peppers belong to the banana family. Another way to detect the difference is to check the tips of the peppers. Banana pepper has a more pointed tip whereas pepperoncini’s tip is round. There is yet another difference which can be detected by slicing the peppers in half. The banana pepper has thick walls whereas pepperoncini have a thin wall. Slicing the pepper to discern the differences can be difficult, so count on the first two options to differentiate banana pepper from the pepperoncini. Banana peppers can easily substitute the pepperoncini if not available. Try them in salads or pickles to replace pepperoncini. The entire culinary world would crumble if there are no peppers, that is how deeply they are engrained into our food culture. From Asian to Chinese, American, European and Mexican cuisine, every meal makes good use of peppers in one form and another. That is why I dared to share everything I knew about the peppers and the varieties which are popularly used. Not every pepper is the same, and now you know it! choose them wisely to maintain the spiciness of your meal and enjoy them all in a variety of forms and sizes. You can only make the best use out of a pepperoncini pepper when you are aware of all it could bring to the table.